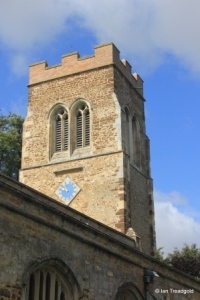 The church of All Saints in Suuthill is situated to the north-west of the hamlet and is accessed from a track at the School Lane junction. 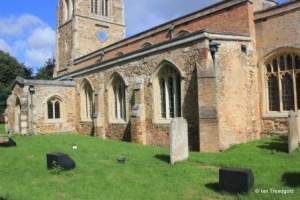 Parking is available in the cemetery car park and the church is a short walk along the track. 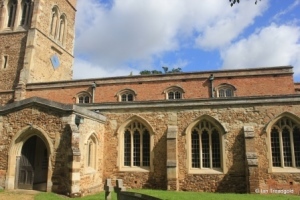 The church has a nave, chancel, north and south aisles, west tower, south porch and the Byng family vault to the north of the chancel. 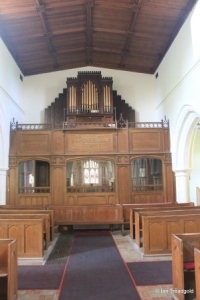 The chancel is around 34 feet long by some 16 feet with the nave adding a further 64 feet by around 20 feet. The aisles are around 11 feet wide and the tower is around 13 feet square and some 72 feet in height. 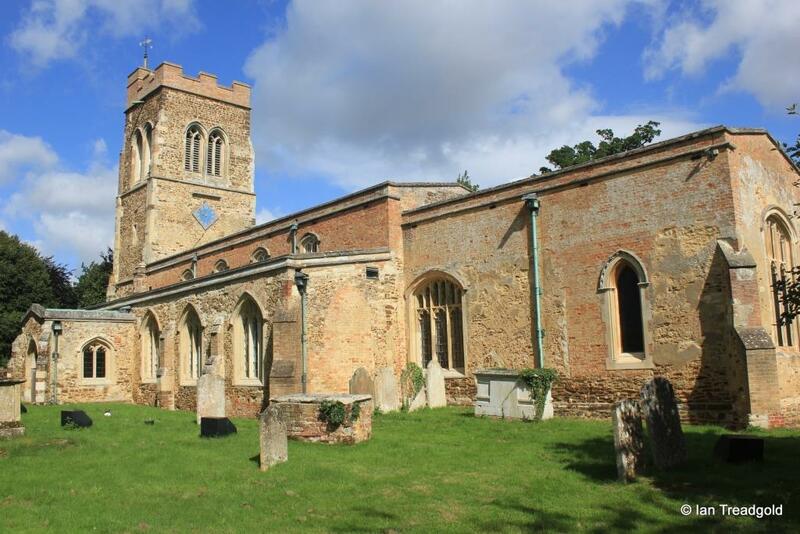 Whilst there is evidence of a church on this site from C13 based on the list of vicars, the origins of the present church are mainly in C15 with a substantial rebuilding & restoration in C19. The building is originally of ironstone cobbles with the C19 restoration work being done in brick. 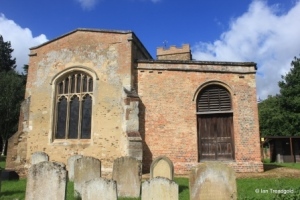 The church was fully rendered prior to the C19 work but this has mostly been removed now revealing the many repairs and restorations. 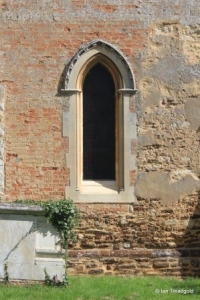 The south aisle has three windows to the east of the porch and one to the west. 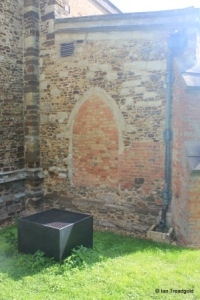 There used to be an east window to the aisle but that was bricked up in the C19 renovations. 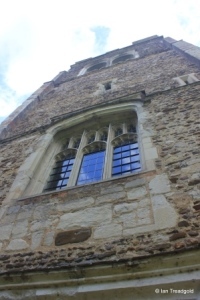 The four south facing windows are all of the same style and date from the C19 works. Each is of three cinquefoiled lights with perpendicular tracery above under four-centred arches. 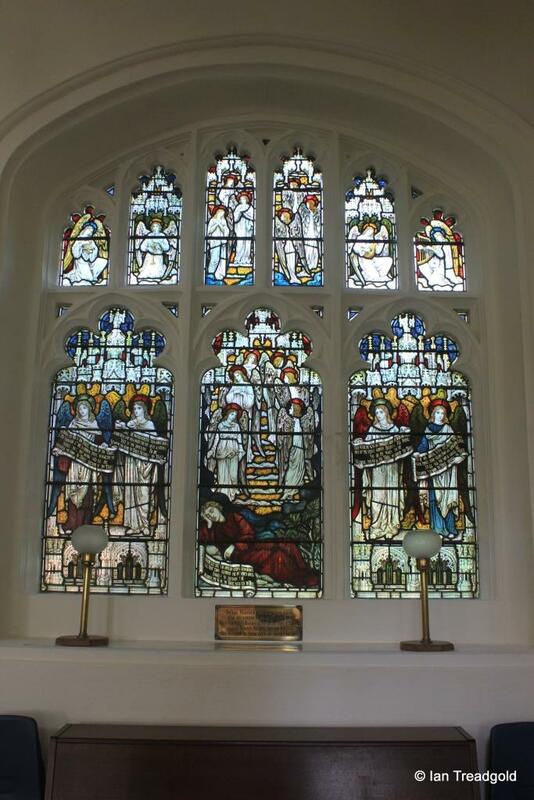 The western window was dedicated to the memory of Joscelyne Whitbread who died in 1936. 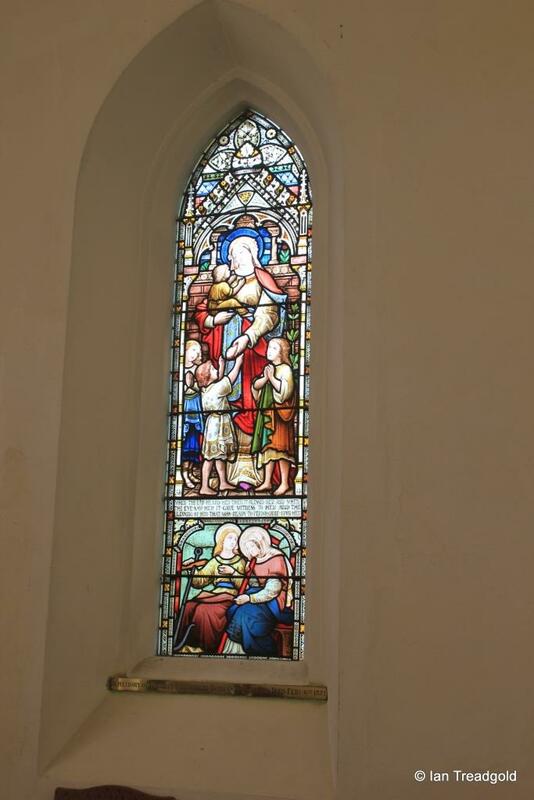 The Whitbread family live at Southill Park and were major patrons of this and other churches in the area. Joscelyne was the daughter of Samuel and Madeline Whitbread. 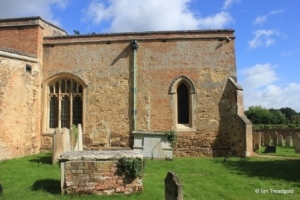 The south porch dates from 1814 and has wide two-light windows to the east and west. 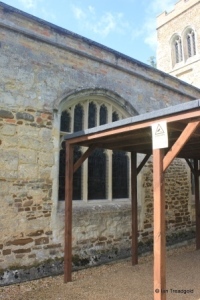 The previous porch had an embattled parapet on top and was higher, matching the aisle in height. 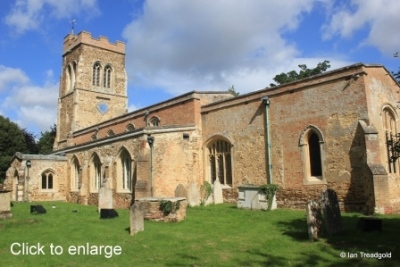 The clerestory above the nave was added in 1814 when the roof was remodelled and replaced two dormer style windows in the sloping roof. The line of the original roof is visible under the clock face. 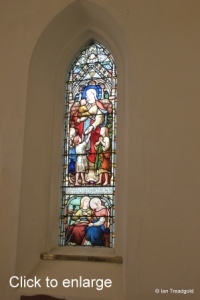 The four clerestory windows are plain two-light windows under four-centred arches. 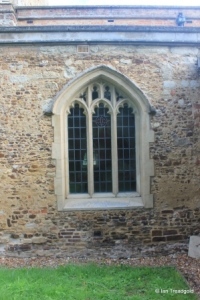 The aisle had a west window which was bricked up in the C19 works. 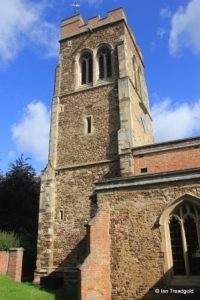 The tower is of three stages with clasping buttresses to the west and an internal stair turret in the south-west corner. There are small lancet lights in the second stage with the east facing clock being set over the light on that side. The belfry lights are conjoined pairs of trefoiled lights with quatrefoil tracery above. The embattled brick parapet at the top is from the C19 works. The west end of the church is hard up against the boundary with Southill Park House and viewing the west end is difficult. 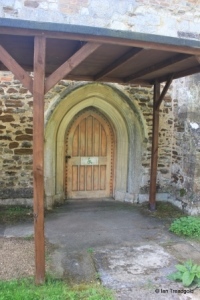 The west doorway has a pointed arch under a square head with tracery in the spandrels, and over it is a window of three cinquefoiled lights. 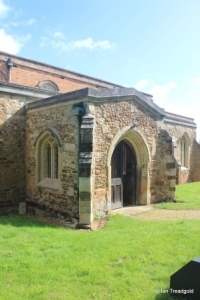 The north aisle is now obscured by modern church facilities incorporating disabled access to the north door. 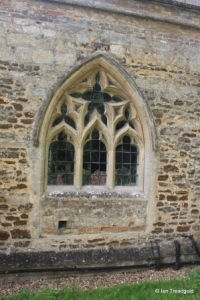 The western window dates from C13 and is of three small trefoiled lights with extensive geometric tracery above under a pointed arch. 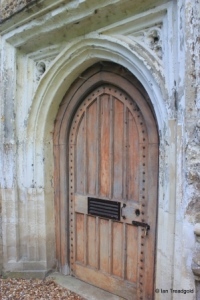 The north doorway dates from C15 and the two windows to the east are of three wide cinquefoiled lights with perpendicular tracery above a transom under four centred arches. 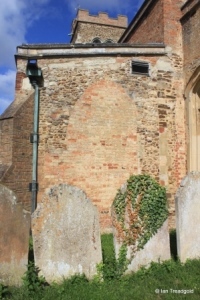 The north side of the chancel is occupied by the Byng vault. The Byng family were the owners of the Southill estate in the late C17. Sir George Byng was created the first Viscount Torrington in 1721 and was granted permission to build the vault in 1733. 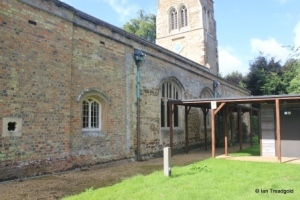 Originally built as a gabled attachment in keeping with the roofline of the church as It was, it was modified along with rest of the church in C19. Several members of the Byng family rest in the vault including the Admiral John Byng who was executed in 1757, not for cowardice or treachery but for an ‘error of judgement’. 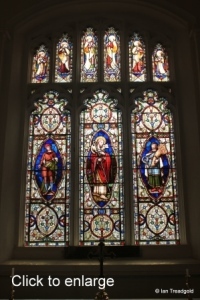 The east window of the church is of three cinquefoiled lights with a transom and perpendicular tracery above under a four centred arch. 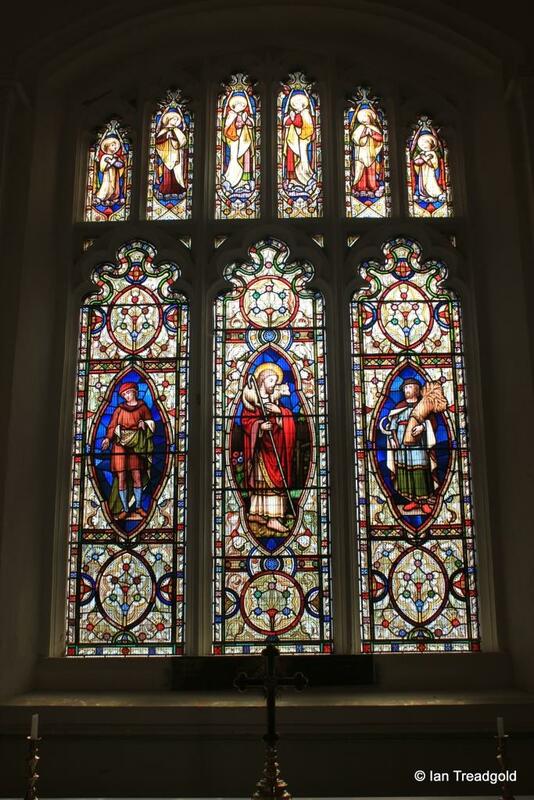 The glass depicts Jesus the Good Shepherd, the Sower and the Reaper and was placed in memory of William Henry Whitbread in 1867. 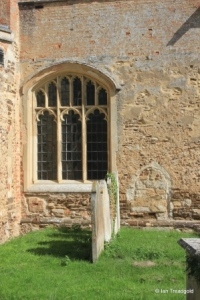 The south side of the chancel has two windows around a blocked doorway. 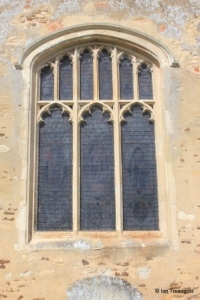 The western window is of a similar style to those in the north aisle being of three cinquefoiled lights under a transom and perpendicular tracery under a four-centred head. 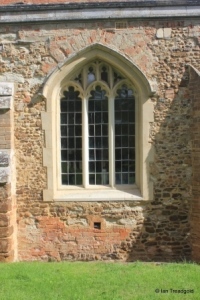 The eastern window is a single uncusped light under a pointed arch with a decorative moulding in the hood-mould. 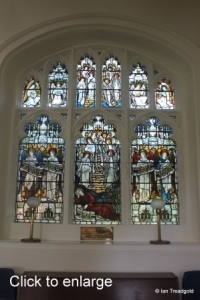 The glass is dedicated to the memory of Harriet Whitbread widow of William Henry Whitbread who died in 1871 and contains an inscription from Job 29. 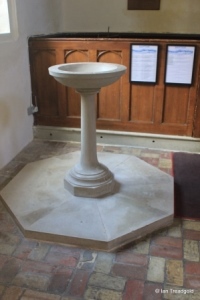 The font is dedicated to Joscelyne Whitbread and is situated at the west end of the south aisle under the window also dedicated to her. The font was designed by Sir Albert Richardson and dates from 1973. The west gallery now closes off the tower from the church and holds the organ. 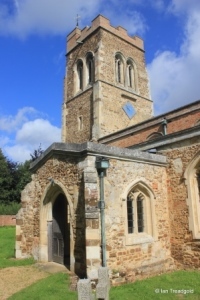 It is accessed by a stair in the south aisle.